It's sad that after all this time the pit-stop and fueling-stragegy elements are still not working properly. I have something prepared, but let me get through those prize payouts first, so I can get a clear head again. 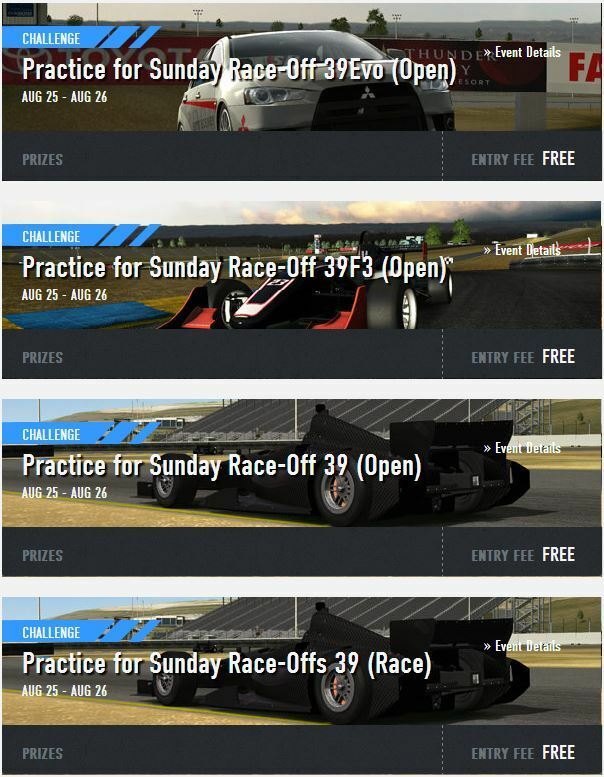 All three events marked "Open" are based in open Practice session. 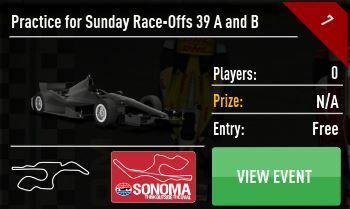 "Race" event is setup in the same way as B race will be. Should allow you to practice the key elements of both A and B races, like Qualifying session and a whole stint, including pitstop. Let me know if there are any issues with any of the above! Dimagico you have to remember that the stream is an important tool for SRW. Having liam commentate in these races turns a boring watch into a very exciting race to watch,this grabs peoples interest far more than just hearing a car engine,i hope he commentates on all races..
i wish the same, but i know the limits. It´s simple.... do you want more show or more racing. To cover everything and organize ... 5 events in half day is quite a task. I would prefer splitting races into two days over weekend and complete coverage if possible... but...a bit longer races with tactics involved! p.s. all respect to Liam... and Cossaco, but their not supermans. You sacrifice quite a lot of your time into this, and you do that even at times when you don´t feel you want to. It´s natural. I can't make it to the EVO event so someone else can drive . Just keep in mind that the pit request confirmation button is "HUD Mode"! S**t...seems I won't be able to make it to the F3 either. I participated in the race B and really liked it. Even though I had to pit in to repair some damage and refuel so as not to eventually have to pit in a second time, mainly due to some incidents which occured in the first lap between me and someone who was behind me. Off course, no hard feelings with whoever has hit me. Besides that, for those who were hit by me, sorry about that. Next time I will be more careful with the braking timing when I am closer to an opponent. Qualifying was better than I expected and I ended up 8th. Got off the line great and took two places. I was behind Dimagico and he braked ridiculously early for turn 2 (we were going through at about 50mph). I had to hit the brakes very harshly to avoid dimagico. It took JohnDaniels by surprise and he hit me in the back and spun. It left me with damage for the rest of the race and I was much slower through the higher downforce corners. I had a good battle with wttnn1 and he passed me very nicely at the hairpin . Somehow held off dimi until lap 23. Not sure if it was intentional but the choice of 25 laps was really good, left the drivers right on the edge of being able to finish without a pit stop. With 2 laps to go and 2 litres of fuel I had to pit. Spent 45 seconds in my pitbox because of repairing damage and I ended up 11th or 12th. I think tonight grivi showed us all what we hope to achieve in sim racing,dominate the field. Also would like to thk our sro team coss,liam and NF for another great evening of racing. Dont try to win on the first lap when you are behind,it never works and all you do is ruin not only the other guys race,but your own too. I totally screwed up, I am very sorry for ruining 3 peoples races (Pilot, JMOO1, Bandito) as well as costing time for those who had to avoid my shocking incidents. Your races were far more important and you guys deserve a good result a whole lot more than I do. I shouldn't have driven so terrible. This was not down to nerves but my terrible driving, I have no excuses. I hit 3 people in exactly the same way, under braking. It was as simple as that, I could not race. well, we were ridiculosely slow... as you said, but if i wasn´t brake there i would collect mrJones infront of me. But of course... i didn´t touch the car infront, but got banged all arround and dropped quite a few places there. Maybee i was a bit too cautious, but i cannot nail championships leader allready in T2 My car was not in top shape after that, so finishing a race was the only objective for me. btw...after i watched real indy cars last night, we were not so awful. I did worry T2 before race because of concertina effect http://en.wikipedia....ccordion_effect, which causes cars to crowd at some point of the track. I was very cautious there, but so should be everyone else. It was my third time that i had damage on car from lap 1 which completely comprimized my race pace, but T2 in Sonoma with this cars will always be tough challenge in lap 1. First off, big thanks for the SRW team and Coss arranging this event for us Another verybig one for letting the support racers start in both races this time !! 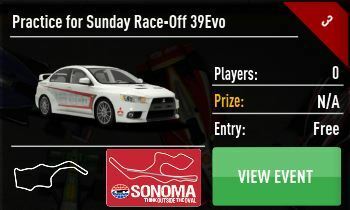 This weekend I joined the two support races for the main event, the EVO X and the F3 battle. The first one came along with evo, where...welll...pretty usual things happened. Disrespectful and ignorant racing in the first laps, where everybody wanted to secure a win from the back of the field. 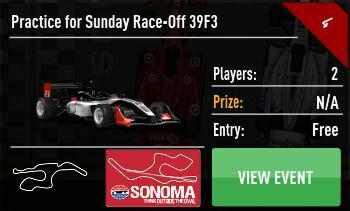 I expected this to happen, got almost off track in the first corner with some help from behind, then someone put his shoulders on me in the chicane from the left, somehow he managed to stay there until turn4, where another boy put his shoulders on my right side to use all my car to take the turn. I got hit from behind as well in that turn, making me hit the guy in front a little bit, but still we took the turn and continued our way 4 wide into turn 5. there the same things happened like the corner just before, and MrPiet missed his braking point in the worst moment, punting me off finally from the race. I barely missed the wall, had to use reverse gear to get back. In the end of the race, Piet gave a place back to me, slowing down showing his intention in the last lap just before we crossed finish line, and after the race he said bigsorry for his mistake, he didn't want to cause me harm. So if there is any penalties planned for him because of that, I ask you to remove it. It was a racing accident, bad luck, not an intentional dirty move like I got from others. Finished in P9 (P10), EVO is not the car to make a miracle comeback from such an awful first lap. The F3 race was very nice, drivers were mostly racing carefully and had lot of respect to other competitors. The qualifying showed that I don't have to worry too much about my pace, I took pole with a half second gap. Did an early escape, as it was a mandatory win for me. Despite it was my very first open wheeler race, and I only had a tiny little bit of experience with this class of racecars, I felt really comfortable with the car. I did my time to practice, watching Launger's replay and a few advices I got from him helped me reach the maximum speed a rookie can have. Thanks again maestro, too bad you missed the race ! Hope we keep F3 race with SRO, with some of the fastest guys around it could be a highly competitive event. Back to the race. After my early runaway, I managed to run the same speed every single lap. 2-3 mistakes done, lost a maximum of 3 tenths with them. The very last lap I overlapped Bolinhas, who struggled big time with his car. He spun in front of me, so I saw the demon from Assen / Z4GT race laughing at me again pressed the brakes gently, I didn't have a tail this time, waited until Boli gets his car off track, and continued my way to the last couple meters of this race. First race win on a sunday race-off, but to be honest, the big dogs were out today, so it just doesn't shine like it should.. The conclusion from the EVO race for me is that I shouldn't race in EVO, and the conclusion from the F3 race is that maybe I should get into openwheeler world and forget about pressinghard for GT class. Looking forward to the next weekend ! if you would be able to say sorry directly after the race, instead of "stfu" id be glad to accept what you wrote above, but honestly.... i doubt you realy regret anything! !